How much does it cost to travel to Delhi? How much money will you need in Delhi? ₨2,382 ($34) is the average daily price for traveling in Delhi. The average price of food for one day is ₨490 ($7.06). The average price of a hotel for a couple is ₨2,881 ($42). Additional pricing is in the table below. These average travel prices have been collected from other travelers to help you plan your own travel budget. How much money do I need for Delhi? Delhi is the largest city in northern India and is officially the country's capital. The city has a population of 11 million with the metropolitan population reaching over 16 million. The city is similar in landscape to the rest of its surrounding area. It is very flat with the river Yamuna flowing on the eastern side of the city. The Aravalii Hills are in the western portion of the city. The city's history dates back to the 6th century BC and it has served as a capital for various kingdoms and empires. The climate in the area is quite extreme, making it difficult to determine the best time to visit the area. The weather can be unbearably hot between April and June. The monsoon rains hit the city between July and September so the roads can be flooded and traffic congestion impossible to navigate. It gets surprisingly cold in December and January and fog can be extreme. Most people generally agree the best time to visit the city is either between February and March or October and November when weather is at its most pleasant. There are countless sights around the city. 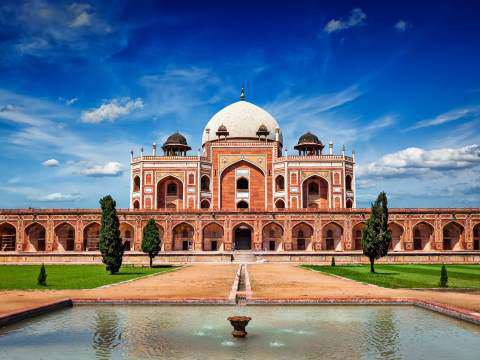 Some of the most famous include the Red Fort, Humayun's tomb, and Qutub complex. Museums in Delhi include Kiran Nadar Museum of Art, Gandhi Smriti, the International Doll's Museum, the National Museum, the National Railway Museum, Nehru Memorial Museum, the Tibet House, and the National Handicrafts and Handlooms Museum. Monuments in Delhi include Rajpath, the India Gate, Jantar Mantar, Raj Ghat, Purana Qila, Tughlaqabad Fort, and Azaad Hind Gram. There are also countless temples and religious sights spread throughout the city. Delhi is a large and sprawling city. It can be divided into the six districts: South Delhi, East Delhi, North Delhi, West Delhi, Central Delhi, and Old Delhi. Central Delhi is where you'll find Connaught Place and Khan Market. Old Delhi was the capital during the Mughal period and has the Kashmere Gate, Chandni Chowk, and Chawri Bazaar. Just walking around Delhi can be an experience in and off itself. There are interesting neighborhoods that are worth exploring and the city's colors, sights, and scents all make for an adventure. One of the best experiences in Delhi is to visit the numerous shopping areas around town. Head to the Chatta Chowk, or covered market, Connaught Place, Paharganj market, Rajouri Garden Market, or Lajpat Nagar which all offer unique experiences. Also make sure you sample a variety of different restaurants and street food stalls throughout town. Soaking up as much of India's culture as you can is really the best way to experience the city. Food in Delhi is excellent. There are restaurants for all budgets. Street food is ubiquitous and excellent. Do make sure you find a place that prepares the food fresh and uses good hygiene practices. There are great restaurants in the Bengali Market near Connaught Place. This area is particularly known for its chaat. Chaat is a North Indian street snack that is comparable to tapas. They typically involve a deep fried pastry shell that is filled with potatoes or lentils among other things. If you're looking for a break from Indian food, there are plenty of international restaurants around Delhi. Prices and food quality may vary. There are also a wide range of fast food restaurants including McDonalds, KFC, Subway, and Pizza Hut. These can typically be found within shopping malls. You're likely to begin or end your trip in Delhi as the city has the area's largest airport, the Indira Gandhi International Airport. Security is tight after terrorist attacks in the country, so even if you have purchased an e-ticket, you will be required to have a printed copy of the document so that you can enter the airport. These rules are taken quite seriously. You have many options to travel around Delhi. There's a good metro system that is relatively smooth and efficient, but it can get very crowded, particularly during peak hours. Do keep an eye on your belongings as pickpockets are abundant. It is best not to carry valuables in your pockets when you travel by metro. Other options to navigate the city include rickshaws, buses, and taxis. The bus system might seem overwhelming at first but if you have access to a good map it's a great way to reach most points around the city. It's best to approach travel in Delhi as an adventure. The traffic is horrible and chaotic and trips may take significantly longer than you expect. If you plan to take a taxi or rickshaw, negotiating the price in advance is a must, and drivers may quote a starting price that is ten times the going rate. If you're a backpacker, you likely show up in places without reservations all the time. Delhi is one place you might consider booking in advance. It's a large, chaotic city, and while you can negotiate hard and get the best price, it's convenient to know exactly where you're headed when you first get there, particularly if you're arriving on a long flight. Taxis from the airport have a set price if you arrange inside the airport. Don't go with any taxi not officially marked. When you depart from the Delhi airport, you must have a copy of you ticket, even if it's an e-ticket. Security is understandably tight, and guards require prove that you're booked on a flight before they let you enter the airport.